"Heliocentric" redirects here. For the albums, see Heliocentric (Paul Weller album) and Heliocentric (The Ocean Collective album). For heliocentric orbit, see Heliocentric orbit. It was not until the 16th century that a mathematical model of a heliocentric system was presented, by the Renaissance mathematician, astronomer, and Catholic cleric Nicolaus Copernicus, leading to the Copernican Revolution. In the following century, Johannes Kepler introduced elliptical orbits, and Galileo Galilei presented supporting observations made using a telescope. A hypothetical geocentric model of the Solar System (upper panel) in comparison to the heliocentric model (lower panel). While the sphericity of the Earth was widely recognized in Greco-Roman astronomy from at least the 4th century BC, the Earth's daily rotation and yearly orbit around the Sun was never universally accepted until the Copernican Revolution. The Ptolemaic system was a sophisticated astronomical system that managed to calculate the positions for the planets to a fair degree of accuracy. Ptolemy himself, in his Almagest, points out that any model for describing the motions of the planets is merely a mathematical device, and since there is no actual way to know which is true, the simplest model that gets the right numbers should be used. However, he rejected the idea of a spinning Earth as absurd as he believed it would create huge winds. His planetary hypotheses were sufficiently real that the distances of the Moon, Sun, planets and stars could be determined by treating orbits' celestial spheres as contiguous realities. This made the stars' distance less than 20 Astronomical Units, a regression, since Aristarchus of Samos's heliocentric scheme had centuries earlier necessarily placed the stars at least two orders of magnitude more distant. Problems with Ptolemy's system were well recognized in medieval astronomy, and an increasing effort to criticize and improve it in the late medieval period eventually led to the Copernican heliocentrism developed in Renaissance astronomy. The non-geocentric model of the Universe was proposed by the Pythagorean philosopher Philolaus (d. 390 BC), who taught that at the center of the Universe was a "central fire", around which the Earth, Sun, Moon and planets revolved in uniform circular motion. This system postulated the existence of a counter-earth collinear with the Earth and central fire, with the same period of revolution around the central fire as the Earth. The Sun revolved around the central fire once a year, and the stars were stationary. The Earth maintained the same hidden face towards the central fire, rendering both it and the "counter-earth" invisible from Earth. The Pythagorean concept of uniform circular motion remained unchallenged for approximately the next 2000 years, and it was to the Pythagoreans that Copernicus referred to show that the notion of a moving Earth was neither new nor revolutionary. Kepler gave an alternative explanation of the Pythagoreans' "central fire" as the Sun, "as most sects purposely hid[e] their teachings". Heraclides of Pontus (4th century BC) said that the rotation of the Earth explained the apparent daily motion of the celestial sphere. It used to be thought that he believed Mercury and Venus to revolve around the Sun, which in turn (along with the other planets) revolves around the Earth. Macrobius Ambrosius Theodosius (AD 395–423) later described this as the "Egyptian System," stating that "it did not escape the skill of the Egyptians," though there is no other evidence it was known in ancient Egypt. The first person known to have proposed a heliocentric system, however, was Aristarchus of Samos (c. 270 BC). Like Eratosthenes, Aristarchus calculated the size of the Earth, and measured the sizes and distances of the Sun and Moon. From his estimates, he concluded that the Sun was six to seven times wider than the Earth, and thought the larger object would have the most attractive force. You are aware ['you' being King Gelon] that "universe" is the name given by most astronomers to the sphere, the centre of which is the centre of the earth, while its radius is equal to the straight line between the centre of the sun and the centre of the earth. This is the common account (τά γραφόμενα), as you have heard from astronomers. But Aristarchus brought out a book consisting of certain hypotheses, wherein it appears, as a consequence of the assumptions made, that the universe is many times greater than the "universe" just mentioned. His hypotheses are that the fixed stars and the sun remain unmoved, that the earth revolves about the sun on the circumference of a circle, the sun lying in the middle of the orbit, and that the sphere of the fixed stars, situated about the same centre as the sun, is so great that the circle in which he supposes the earth to revolve bears such a proportion to the distance of the fixed stars as the centre of the sphere bears to its surface. Aristarchus presumably took the stars to be very far away because he was aware that their parallax would otherwise be observed over the course of a year. The stars are in fact so far away that stellar parallax only became detectable when sufficiently powerful telescopes had been developed. Only do not, my good fellow, enter an action against me for impiety in the style of Cleanthes, who thought it was the duty of Greeks to indict Aristarchus of Samos on the charge of impiety for putting in motion the Hearth of the Universe, this being the effect of his attempt to save the phenomena by supposing the heaven to remain at rest and the earth to revolve in an oblique circle, while it rotates, at the same time, about its own axis. Only scattered fragments of Cleanthes's writings have survived in quotations by other writers, but in Lives and Opinions of Eminent Philosophers, Diogenes Laërtius lists A reply to Aristarchus (Πρὸς Ἀρίσταρχον) as one of Cleanthes's works, and some scholars have suggested that this might have been where Cleanthes had accused Aristarchus of impiety. Did Plato put the earth in motion, as he did the sun, the moon, and the five planets, which he called the instruments of time on account of their turnings, and was it necessary to conceive that the earth "which is globed about the axis stretched from pole to pole through the whole universe" was not represented as being held together and at rest, but as turning and revolving (στρεφομένην καὶ ἀνειλουμένην), as Aristarchus and Seleucus afterwards maintained that it did, the former stating this as only a hypothesis (ὑποτιθέμενος μόνον), the latter as a definite opinion (καὶ ἀποφαινόμενος) ? The remaining references to Aristarchus's heliocentrism are extremely brief, and provide no more information beyond what can be gleaned from those already cited. Ones which mention Aristarchus explicitly by name occur in Aëtius's Opinions of the Philosophers, Sextus Empiricus's Against the Mathematicians, and an anonymous scholiast to Aristotle. Another passage in Aëtius's Opinions of the Philosophers reports that Seleucus the astronomer had affirmed the Earth's motion, but does not mention Aristarchus. Since Plutarch mentions the "followers of Aristarchus" in passing, it is likely that there were other astronomers in the Classical period who also espoused heliocentrism, but whose work was lost. The only other astronomer from antiquity known by name who is known to have supported Aristarchus' heliocentric model was Seleucus of Seleucia (b. 190 BC), a Hellenistic astronomer who flourished a century after Aristarchus in the Seleucid empire. Seleucus was a proponent of the heliocentric system of Aristarchus. Seleucus may have proved the heliocentric theory by determining the constants of a geometric model for the heliocentric theory and developing methods to compute planetary positions using this model. He may have used early trigonometric methods that were available in his time, as he was a contemporary of Hipparchus. A fragment of a work by Seleucus has survived in Arabic translation, which was referred to by Rhazes (b. 865). Alternatively, his explanation may have involved the phenomenon of tides, which he supposedly theorized to be caused by the attraction to the Moon and by the revolution of the Earth around the Earth and Moon's center of mass. There were occasional speculations about heliocentrism in Europe before Copernicus. In Roman Carthage, the pagan Martianus Capella (5th century A.D.) expressed the opinion that the planets Venus and Mercury did not go about the Earth but instead circled the Sun. Capella's model was discussed in the Early Middle Ages by various anonymous 9th-century commentators and Copernicus mentions him as an influence on his own work. The Ptolemaic system was also received in Indian astronomy. Aryabhata (476–550), in his magnum opus Aryabhatiya (499), propounded a planetary model in which the Earth was taken to be spinning on its axis and the periods of the planets were given with respect to the Sun. His immediate commentators, such as Lalla, and other later authors, rejected his innovative view about the turning Earth. He also made many astronomical calculations, such as the times of the solar and lunar eclipses, and the instantaneous motion of the Moon. Early followers of Aryabhata's model included Varahamihira, Brahmagupta, and Bhaskara II. For a time, Muslim astronomers accepted the Ptolemaic system and the geocentric model, which were used by al-Battani to show that the distance between the Sun and the Earth varies. In the 10th century, al-Sijzi accepted that the Earth rotates around its axis. According to later astronomer al-Biruni, al-Sijzi invented an astrolabe called al-zūraqī based on a belief held by some of his contemporaries that the apparent motion of the stars was due to the Earth's movement, and not that of the firmament. Islamic astronomers began to criticize the Ptolemaic model, including Ibn al-Haytham in his Al-Shukūk 'alā Baṭalamiyūs ("Doubts Concerning Ptolemy", c. 1028), who branded it an impossibility. Al-Biruni discussed the possibility of whether the Earth rotated about its own axis and orbited the Sun, but in his Masudic Canon (1031), he expressed his faith in a geocentric and stationary Earth. He was aware that if the Earth rotated on its axis, it would be consistent with his astronomical observations, but considered it a problem of natural philosophy rather than one of mathematics. In the 12th century, non-heliocentric alternatives to the Ptolemaic system were developed by some Islamic astronomers, such as Nur ad-Din al-Bitruji, who considered the Ptolemaic model mathematical, and not physical. His system spread throughout most of Europe in the 13th century, with debates and refutations of his ideas continued to the 16th century. The Maragha school of astronomy in Ilkhanid-era Persia further developed "non-Ptolemaic" planetary models involving Earth's rotation. Notable astronomers of this school are Al-Urdi (d. 1266) Al-Katibi (d. 1277), and Al-Tusi (d. 1274). The arguments and evidence used resemble those used by Copernicus to support the Earth's motion. The criticism of Ptolemy as developed by Averroes and by the Maragha school explicitly address the Earth's rotation but it did not arrive at explicit heliocentrism. The observations of the Maragha school were further improved at the Timurid-era Samarkand observatory under Qushji (1403–1474). European scholarship in the later medieval period actively received astronomical models developed in the Islamic world and by the 13th century was well aware of the problems of the Ptolemaic model. In the 14th century, bishop Nicole Oresme discussed the possibility that the Earth rotated on its axis, while Cardinal Nicholas of Cusa in his Learned Ignorance asked whether there was any reason to assert that the Sun (or any other point) was the center of the universe. In parallel to a mystical definition of God, Cusa wrote that "Thus the fabric of the world (machina mundi) will quasi have its center everywhere and circumference nowhere," recalling Hermes Trismegistus. In India, Nilakantha Somayaji (1444–1544), in his Aryabhatiyabhasya, a commentary on Aryabhata's Aryabhatiya, developed a computational system for a geo-heliocentric planetary model, in which the planets orbit the Sun, which in turn orbits the Earth, similar to the system later proposed by Tycho Brahe. In the Tantrasamgraha (1501), Somayaji further revised his planetary system, which was mathematically more accurate at predicting the heliocentric orbits of the interior planets than both the Tychonic and Copernican models, but did not propose any specific models of the universe. Nilakantha's planetary system also incorporated the Earth's rotation on its axis. Most astronomers of the Kerala school of astronomy and mathematics seem to have accepted his planetary model. Some historians maintain that the thought of the Maragheh observatory, in particular the mathematical devices known as the Urdi lemma and the Tusi couple, influenced Renaissance-era European astronomy, and thus was indirectly received by Renaissance-era European astronomy and thus by Copernicus. Copernicus used such devices in the same planetary models as found in Arabic sources. Furthermore, the exact replacement of the equant by two epicycles used by Copernicus in the Commentariolus was found in an earlier work by Ibn al-Shatir (d. c. 1375) of Damascus. Copernicus' lunar and Mercury models are also identical to Ibn al-Shatir's. The state of knowledge on planetary theory received by Copernicus is summarized in Georg von Peuerbach's Theoricae Novae Planetarum (printed in 1472 by Regiomontanus). By 1470, the accuracy of observations by the Vienna school of astronomy, of which Peuerbach and Regiomontanus were members, was high enough to make the eventual development of heliocentrism inevitable, and indeed it is possible that Regiomontanus did arrive at an explicit theory of heliocentrism before his death in 1476, some 30 years before Copernicus. While the influence of the criticism of Ptolemy by Averroes on Renaissance thought is clear and explicit, the claim of direct influence of the Maragha school, postulated by Otto E. Neugebauer in 1957, remains an open question.Since the Tusi couple was used by Copernicus in his reformulation of mathematical astronomy, there is a growing consensus that he became aware of this idea in some way. It has been suggested that the idea of the Tusi couple may have arrived in Europe leaving few manuscript traces, since it could have occurred without the translation of any Arabic text into Latin. One possible route of transmission may have been through Byzantine science, which translated some of al-Tusi's works from Arabic into Byzantine Greek. Several Byzantine Greek manuscripts containing the Tusi-couple are still extant in Italy. Other scholars have argued that Copernicus could well have developed these ideas independently of the late Islamic tradition. Copernicus explicitly references several astronomers of the "Islamic Golden Age" (10th to 12th centuries) in De Revolutionibus: Albategnius (Al-Battani), Averroes (Ibn Rushd), Thebit (Thabit Ibn Qurra), Arzachel (Al-Zarqali), and Alpetragius (Al-Bitruji), but he does not show awareness of the existence of any of the later astronomers of the Maragha school. It has been argued that Copernicus could have independently discovered the Tusi couple or took the idea from Proclus's Commentary on the First Book of Euclid, which Copernicus cited. Another possible source for Copernicus's knowledge of this mathematical device is the Questiones de Spera of Nicole Oresme, who described how a reciprocating linear motion of a celestial body could be produced by a combination of circular motions similar to those proposed by al-Tusi. Nicolaus Copernicus in his De revolutionibus orbium coelestium ("On the revolution of heavenly spheres", first printed in 1543 in Nuremberg), presented a discussion of a heliocentric model of the universe in much the same way as Ptolemy in the 2nd century had presented his geocentric model in his Almagest. Copernicus discussed the philosophical implications of his proposed system, elaborated it in geometrical detail, used selected astronomical observations to derive the parameters of his model, and wrote astronomical tables which enabled one to compute the past and future positions of the stars and planets. In doing so, Copernicus moved heliocentrism from philosophical speculation to predictive geometrical astronomy. 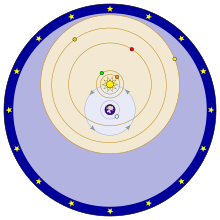 In reality, Copernicus's system did not predict the planets' positions any better than the Ptolemaic system. This theory resolved the issue of planetary retrograde motion by arguing that such motion was only perceived and apparent, rather than real: it was a parallax effect, as an object that one is passing seems to move backwards against the horizon. This issue was also resolved in the geocentric Tychonic system; the latter, however, while eliminating the major epicycles, retained as a physical reality the irregular back-and-forth motion of the planets, which Kepler characterized as a "pretzel". The first information about the heliocentric views of Nicolaus Copernicus was circulated in manuscript completed some time before May 1, 1514. Although only in manuscript, Copernicus' ideas were well known among astronomers and others. His ideas contradicted the then-prevailing understanding of the Bible. In the King James Bible (first published in 1611), First Chronicles 16:30 states that "the world also shall be stable, that it be not moved." Psalm 104:5 says, "[the Lord] Who laid the foundations of the earth, that it should not be removed for ever." Ecclesiastes 1:5 states that "The sun also ariseth, and the sun goeth down, and hasteth to his place where he arose." Nonetheless, in 1533, Johann Albrecht Widmannstetter delivered in Rome a series of lectures outlining Copernicus' theory. The lectures were heard with interest by Pope Clement VII and several Catholic cardinals. On November 1, 1536, Archbishop of Capua Nikolaus von Schönberg wrote a letter to Copernicus from Rome encouraging him to publish a full version of his theory. This was reported in the context of a conversation at the dinner table and not a formal statement of faith. Melanchthon, however, opposed the doctrine over a period of years. Nicolaus Copernicus published the definitive statement of his system in De Revolutionibus in 1543. Copernicus began to write it in 1506 and finished it in 1530, but did not publish it until the year of his death. Although he was in good standing with the Church and had dedicated the book to Pope Paul III, the published form contained an unsigned preface by Osiander defending the system and arguing that it was useful for computation even if its hypotheses were not necessarily true. Possibly because of that preface, the work of Copernicus inspired very little debate on whether it might be heretical during the next 60 years. There was an early suggestion among Dominicans that the teaching of heliocentrism should be banned, but nothing came of it at the time. Some years after the publication of De Revolutionibus John Calvin preached a sermon in which he denounced those who "pervert the order of nature" by saying that "the sun does not move and that it is the earth that revolves and that it turns". On the other hand, Calvin is not responsible for another famous quotation which has often been misattributed to him: "Who will venture to place the authority of Copernicus above that of the Holy Spirit?" It has long been established that this line cannot be found in any of Calvin's works. It has been suggested that the quotation was originally sourced from the works of Lutheran theologian Abraham Calovius. In this depiction of the Tychonic system, the objects on blue orbits (the Moon and the Sun) revolve around the Earth. The objects on orange orbits (Mercury, Venus, Mars, Jupiter, and Saturn) revolve around the Sun. Around all is a sphere of fixed stars, located just beyond Saturn. Prior to the publication of De Revolutionibus, the most widely accepted system had been proposed by Ptolemy, in which the Earth was the center of the universe and all celestial bodies orbited it. Tycho Brahe, arguably the most accomplished astronomer of his time, advocated against Copernicus's heliocentric system and for an alternative to the Ptolemaic geocentric system: a geo-heliocentric system now known as the Tychonic system in which the five then known planets orbit the Sun, while the Sun and the Moon orbit the Earth. Tycho appreciated the Copernican system, but objected to the idea of a moving Earth on the basis of physics, astronomy, and religion. The Aristotelian physics of the time (modern Newtonian physics was still a century away) offered no physical explanation for the motion of a massive body like Earth, whereas it could easily explain the motion of heavenly bodies by postulating that they were made of a different sort substance called aether that moved naturally. So Tycho said that the Copernican system "... expertly and completely circumvents all that is superfluous or discordant in the system of Ptolemy. On no point does it offend the principle of mathematics. Yet it ascribes to the Earth, that hulking, lazy body, unfit for motion, a motion as quick as that of the aethereal torches, and a triple motion at that." Likewise, Tycho took issue with the vast distances to the stars that Aristarchus and Copernicus had assumed in order to explain the lack of any visible parallax. Tycho had measured the apparent sizes of stars (now known to be illusory – see stellar magnitude), and used geometry to calculate that in order to both have those apparent sizes and be as far away as heliocentrism required, stars would have to be huge (much larger than the sun; the size of Earth's orbit or larger). Regarding this Tycho wrote, "Deduce these things geometrically if you like, and you will see how many absurdities (not to mention others) accompany this assumption [of the motion of the earth] by inference." He also cited the Copernican system's "opposition to the authority of Sacred Scripture in more than one place" as a reason why one might wish to reject it, and observed that his own geo-heliocentric alternative "offended neither the principles of physics nor Holy Scripture". The Jesuit astronomers in Rome were at first unreceptive to Tycho's system; the most prominent, Clavius, commented that Tycho was "confusing all of astronomy, because he wants to have Mars lower than the Sun." However, after the advent of the telescope showed problems with some geocentric models (by demonstrating that Venus circles the Sun, for example), the Tychonic system and variations on that system became popular among geocentrists, and the Jesuit astronomer Giovanni Battista Riccioli would continue Tycho's use of physics, stellar astronomy (now with a telescope), and religion to argue against heliocentrism and for Tycho's system well into the seventeenth century (see Riccioli). Galileo was able to look at the night sky with the newly invented telescope. He published his discoveries that the Sun rotated and that Venus exhibited a full range of phases in his Letters on Sunspots (1613). These discoveries were not consistent with the Ptolemeic model of the Solar System. As the Jesuit astronomers confirmed Galileo's observations, the Jesuits moved toward Tycho's teachings. In his 1615 "Letter to the Grand Duchess Christina", Galileo defended heliocentrism, and claimed it was not contrary to Holy Scripture. He took Augustine's position on Scripture: not to take every passage literally when the scripture in question is in a Bible book of poetry and songs, not a book of instructions or history. The writers of the Scripture wrote from the perspective of the terrestrial world, and from that vantage point the Sun does rise and set. In fact, it is the Earth's rotation which gives the impression of the Sun in motion across the sky. In February 1615, prominent Dominicans including Thomaso Caccini and Niccolò Lorini brought Galileo's writings on heliocentrism to the attention of the Inquisition, because they appeared to violate Holy Scripture and the decrees of the Council of Trent. Cardinal and Inquisitor Robert Bellarmine was called upon to adjudicate, and wrote in April that treating heliocentrism as a real phenomenon would be "a very dangerous thing," irritating philosophers and theologians, and harming "the Holy Faith by rendering Holy Scripture as false." In January 1616 Msgr. Francesco Ingoli addressed an essay to Galileo disputing the Copernican system. Galileo later stated that he believed this essay to have been instrumental in the ban against Copernicanism that followed in February. According to Maurice Finocchiaro, Ingoli had probably been commissioned by the Inquisition to write an expert opinion on the controversy, and the essay provided the "chief direct basis" for the ban. The essay focused on eighteen physical and mathematical arguments against heliocentrism. It borrowed primarily from the arguments of Tycho Brahe, and it notedly mentioned the problem that heliocentrism requires the stars to be much larger than the Sun. Ingoli wrote that the great distance to the stars in the heliocentric theory "clearly proves ... the fixed stars to be of such size, as they may surpass or equal the size of the orbit circle of the Earth itself." Ingoli included four theological arguments in the essay, but suggested to Galileo that he focus on the physical and mathematical arguments. Galileo did not write a response to Ingoli until 1624. In March, after the Inquisition's injunction against Galileo, the papal Master of the Sacred Palace, Congregation of the Index, and Pope banned all books and letters advocating the Copernican system, which they called "the false Pythagorean doctrine, altogether contrary to Holy Scripture." In 1618 the Holy Office recommended that a modified version of Copernicus' De Revolutionibus be allowed for use in calendric calculations, though the original publication remained forbidden until 1758. In Astronomia nova (1609), Johannes Kepler had used an elliptical orbit to explain the motion of Mars. In Epitome astronomiae Copernicanae (1617–1621) he developed a heliocentric model of the Solar System in which all the planets have elliptical orbits. This provided significantly increased accuracy in predicting the position of the planets. Kepler's ideas were not immediately accepted. Galileo for example completely ignored Kepler's work. Kepler proposed heliocentrism as a physical description of the Solar System and Epitome astronomia Copernicanae was placed on the index of prohibited books despite Kepler being a Protestant. Some ecclesiastics also interpreted the book as characterizing the Pope as a simpleton, since his viewpoint in the dialogue was advocated by the character Simplicio. Urban VIII became hostile to Galileo and he was again summoned to Rome. Galileo's trial in 1633 involved making fine distinctions between "teaching" and "holding and defending as true". 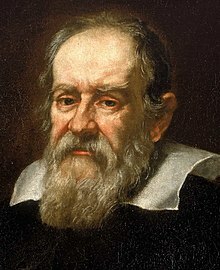 For advancing heliocentric theory Galileo was forced to recant Copernicanism and was put under house arrest for the last few years of his life. According to J. L. Heilbron, informed contemporaries of Galileo's "appreciated that the reference to heresy in connection with Galileo or Copernicus had no general or theological significance." René Descartes postponed, and ultimately never finished, his treatise The World, which included a heliocentric model, but the Galileo affair did little to slow the spread of heliocentrism across Europe, as Kepler's Epitome of Copernican Astronomy became increasingly influential in the coming decades. By 1686 the model was well enough established that the general public was reading about it in Conversations on the Plurality of Worlds, published in France by Bernard le Bovier de Fontenelle and translated into English and other languages in the coming years. It has been called "one of the first great popularizations of science." In 1687, Isaac Newton published Philosophiæ Naturalis Principia Mathematica, which provided an explanation for Kepler's laws in terms of universal gravitation and what came to be known as Newton's laws of motion. This placed heliocentrism on a firm theoretical foundation, although Newton's heliocentrism was of a somewhat modern kind. Already in the mid-1680s he recognized the "deviation of the Sun" from the centre of gravity of the Solar System. For Newton it was not precisely the centre of the Sun or any other body that could be considered at rest, but "the common centre of gravity of the Earth, the Sun and all the Planets is to be esteem'd the Centre of the World", and this centre of gravity "either is at rest or moves uniformly forward in a right line". Newton adopted the "at rest" alternative in view of common consent that the centre, wherever it was, was at rest. Meanwhile, the Catholic Church remained opposed to heliocentrism as a literal description, but this did not by any means imply opposition to all astronomy; indeed, it needed observational data to maintain its calendar. In support of this effort it allowed the cathedrals themselves to be used as solar observatories called meridiane; i.e., they were turned into "reverse sundials", or gigantic pinhole cameras, where the Sun's image was projected from a hole in a window in the cathedral's lantern onto a meridian line. In 1664, Pope Alexander VII published his Index Librorum Prohibitorum Alexandri VII Pontificis Maximi jussu editus (Index of Prohibited Books, published by order of Alexander VII, P.M.) which included all previous condemnations of heliocentric books. In the mid-eighteenth century the Catholic Church's opposition began to fade. An annotated copy of Newton's Principia was published in 1742 by Fathers le Seur and Jacquier of the Franciscan Minims, two Catholic mathematicians, with a preface stating that the author's work assumed heliocentrism and could not be explained without the theory. In 1758 the Catholic Church dropped the general prohibition of books advocating heliocentrism from the Index of Forbidden Books. The Observatory of the Roman College was established by Pope Clement XIV in 1774 (nationalized in 1878, but re-founded by Pope Leo XIII as the Vatican Observatory in 1891). In spite of dropping its active resistance to heliocentrism, the Catholic Church did not lift the prohibition of uncensored versions of Copernicus's De Revolutionibus or Galileo's Dialogue. The affair was revived in 1820, when the Master of the Sacred Palace (the Catholic Church's chief censor), Filippo Anfossi, refused to license a book by a Catholic canon, Giuseppe Settele, because it openly treated heliocentrism as a physical fact. Settele appealed to pope Pius VII. After the matter had been reconsidered by the Congregation of the Index and the Holy Office, Anfossi's decision was overturned. Pius VII approved a decree in 1822 by the Sacred Congregation of the Inquisition to allow the printing of heliocentric books in Rome. Copernicus's De Revolutionibus and Galileo's Dialogue were then subsequently omitted from the next edition of the Index when it appeared in 1835. Already in the Talmud, Greek philosophy and science under general name "Greek wisdom" were considered dangerous. They were put under ban then and later for some periods. The first Jewish scholar to describe the Copernican system, albeit without mentioning Copernicus by name, was Maharal of Prague, his book "Be'er ha-Golah" (1593). Maharal makes an argument of radical skepticism, arguing that no scientific theory can be reliable, which he illustrates by the new-fangled theory of heliocentrism upsetting even the most fundamental views on the cosmos. Copernicus is mentioned in the books of David Gans (1541–1613), who worked with Tycho Brahe and Johannes Kepler. Gans wrote two books on astronomy in Hebrew: a short one "Magen David" (1612) and a full one "Nehmad veNaim" (published only in 1743). He described objectively three systems: Ptolemy, Copernicus and of Tycho Brahe without taking sides. Joseph Solomon Delmedigo (1591–1655) in his "Elim" (1629) says that the arguments of Copernicus are so strong, that only an imbecile will not accept them. Delmedigo studied at Padua and was acquainted with Galileo. 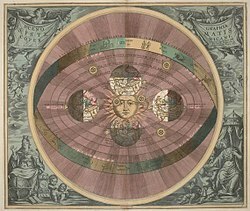 An actual controversy on the Copernican model within Judaism arises only in the early 18th century. Most authors in this period accept Copernican heliocentrism, with opposition from David Nieto and Tobias Cohn. Both of these authors argued against heliocentrism on grounds of contradictions to scripture. Nieto merely rejected the new system on those grounds without much passion, whereas Cohn went so far as to call Copernicus "a first-born of Satan", though he also acknowledged that he would have found it difficult to counter one particular objection based on a passage from the Talmud. In the 19th century two students of the Hatam sofer wrote books that were given approbations by him even though one supported heliocentrism and the other geocentrism. The one, a commentary on Genesis Yafe’ah le-Ketz written by R. Israel David Schlesinger resisted a heliocentric model and supported geocentrism. The other, Mei Menuchot written by R. Eliezer Lipmann Neusatz encouraged acceptance of the heliocentric model and other modern scientific thinking. Since the 20th century most Jews have not questioned the science of heliocentrism. Exceptions include Shlomo Benizri and R. M.M. Schneerson of Chabad who argued that the question of heliocentrism vs. geocentrism is obsolete because of the relativity of motion. Schneerson's followers in Chabad continue to deny the heliocentric model. Kepler's laws of planetary motion were used as arguments in favor of the heliocentric hypothesis. Three apparent proofs of the heliocentric hypothesis were provided in 1727 by James Bradley, in 1838 by Friedrich Wilhelm Bessel and in 1851 by Foucault. Bradley discovered the stellar aberration, proving the relative motion of the Earth. Bessel proved that the parallax of a star was greater than zero by measuring the parallax of 0.314 arcseconds of a star named 61 Cygni. In the same year Friedrich Georg Wilhelm Struve and Thomas Henderson measured the parallaxes of other stars, Vega and Alpha Centauri. The thinking that the heliocentric view was also not true in a strict sense was achieved in steps. That the Sun was not the center of the universe, but one of innumerable stars, was strongly advocated by the mystic Giordano Bruno. Over the course of the 18th and 19th centuries, the status of the Sun as merely one star among many became increasingly obvious. By the 20th century, even before the discovery that there are many galaxies, it was no longer an issue. The concept of an absolute velocity, including being "at rest" as a particular case, is ruled out by the principle of relativity, also eliminating any obvious "center" of the universe as a natural origin of coordinates. Some forms of Mach's principle consider the frame at rest with respect to the distant masses in the universe to have special properties. Even if the discussion is limited to the Solar System, the Sun is not at the geometric center of any planet's orbit, but rather approximately at one focus of the elliptical orbit. Furthermore, to the extent that a planet's mass cannot be neglected in comparison to the Sun's mass, the center of gravity of the Solar System is displaced slightly away from the center of the Sun. (The masses of the planets, mostly Jupiter, amount to 0.14% of that of the Sun.) Therefore, a hypothetical astronomer on an extrasolar planet would observe a small "wobble" in the Sun's motion. In modern calculations, the terms "geocentric" and "heliocentric" are often used to refer to reference frames. In such systems the origin in the center of mass of the Earth, of the Earth–Moon system, of the Sun, of the Sun plus the major planets, or of the entire Solar System, can be selected. Right ascension and declination are examples of geocentric coordinates, used in Earth-based observations, while the heliocentric latitude and longitude are used for orbital calculations. This leads to such terms as "heliocentric velocity" and "heliocentric angular momentum". In this heliocentric picture, any planet of the Solar System can be used as a source of mechanical energy because it moves relatively to the Sun. A smaller body (either artificial or natural) may gain heliocentric velocity due to gravity assist – this effect can change the body's mechanical energy in heliocentric reference frame (although it will not changed in the planetary one). However, such selection of "geocentric" or "heliocentric" frames is merely a matter of computation. It does not have philosophical implications and does not constitute a distinct physical or scientific model. From the point of view of general relativity, inertial reference frames do not exist at all, and any practical reference frame is only an approximation to the actual space-time, which can have higher or lower precision. ^ Optionally capitalised, Heliocentrism or heliocentrism, according to The Shorter Oxford English Dictionary (6th ed., 2007). The term is a learned formation based on Greek ἥλιος Helios "Sun" and κέντρον kentron "center"; the adjective heliocentric is first recorded in English (as heliocentrick) in 1685, after New Latin heliocentricus, in use from about the same time (Johann Jakob Zimmermann, Prodromus biceps cono ellipticæ et a priori demonstratæ planetarum theorices, 1679, p. 28). The abstract noun in -ism is more recent, recorded from the late 19th century (e.g. in Constance Naden, Induction and Deduction: A Historical and Critical Sketch of Successive Philosophical Conceptions Respecting the Relations Between Inductive and Deductive Thought and Other Essays (1890), p. 76: "Copernicus started from the observed motions of the planets, on which astronomers were agreed, and worked them out on the new hypothesis of Heliocentrism"), modelled after German Heliocentrismus or Heliozentrismus (c. 1870). ^ According to Lucio Russo, the heliocentric view was expounded in Hipparchus's work on gravity. ^ The image shows a woodcut by Christoph Murer, from Nicolaus Reusner's Icones (printed 1578), allegedly after a (lost) self-portrait by Copernicus himself; the Murer portrait became the template for a number of later (17th century) woodcuts, copper engravings and paintings of Copernicus. ^ Dicks, D.R. (1970). Early Greek Astronomy to Aristotle. Ithaca, N.Y.: Cornell University Press. p. 68. ISBN 978-0-8014-0561-7. ^ In Book 1 section 7 he admits that a model in which the Earth revolves with respect to the stars would be simpler but doesn't go as far as considering a heliocentric system. ^ Heath (1913, p.302). The italics and parenthetical comments are as they appear in Heath's original. ^ That is, an apparent movement of the stars relative to the celestial poles and equator, and to each other, caused by the Earth's revolution around the Sun. ^ Although it could obviously be reasonably inferred therefrom. ^ Heath (1913, p.304). Most modern scholars share Heath's opinion that it is Cleanthes in this passage who is being held as having accused Aristarchus of impiety (see Gent & Godwin 1883, p.240; Dreyer 1906, p.138; Prickard, 1911, p.20; Cherniss 1957, p.55; for example). The manuscripts of Plutarch's On the Face in the Orb of the Moon that have come down to us are corrupted, however, and the traditional interpretation of the passage has been challenged by Lucio Russo, who insists that it should be interpreted as having Aristarchus rhetorically suggest that Cleanthes was being impious for wanting to shift the Sun from its proper place at the center of the universe (Russo, 2013, p.82; Russo & Medaglia, 1996, pp.113-7). ^ Edwards (1998, p.68 and n.104, p.455), for instance. ^ a b c Heath (1913, p.305). ^ "Index of Ancient Greek Philosophers-Scientists". Ics.forth.gr. Archived from the original on January 27, 2018. Retrieved November 20, 2018. ^ Bartel, B. L. (1987), "The Heliocentric System in Greek, Persian and Hindu Astronomy", Annals of the New York Academy of Sciences, 500 (1): 525–545 [527–529], Bibcode:1987NYASA.500..525V, doi:10.1111/j.1749-6632.1987.tb37224.x. ^ Eastwood, Bruce S. (1982), "Kepler as Historian of Science: Precursors of Copernican Heliocentrism according to De revolutionibus I, 10", Proceedings of the American Philosophical Society, 126: 367–394. ^ Thurston 1994, p. 188. ^ Plofker, Kim (2009). Mathematics in India. Princeton: Princeton University Press. pp. 111–112. ISBN 9781400834075. OCLC 650305544. ^ Joseph 2000, pp. 393–4, 408. ^ "Al-Battani". Famous Scientists. Retrieved November 20, 2018. ^ a b c Young, M. J. L., ed. (2006). Religion, Learning and Science in the 'Abbasid Period. Cambridge University Press. p. 413. ISBN 9780521028875. ^ Nasr, Seyyed Hossein (January 1, 1993). An Introduction to Islamic Cosmological Doctrines. SUNY Press. p. 135. ISBN 9781438414195. ^ Hoskin, Michael (March 13, 1999). The Cambridge Concise History of Astronomy. Cambridge University Press. p. 60. ISBN 9780521576000. ^ Covington, Richard. "Rediscovering Arabic Science". Aramco World. Retrieved November 20, 2018. ^ E. S. Kennedy, "Al-Bīrūnī's Masudic Canon", Al-Abhath, 24 (1971): 59–81; reprinted in David A. King and Mary Helen Kennedy, ed., Studies in the Islamic Exact Sciences, Beirut, 1983, pp. 573–595. ^ a b Saliba (1999). ^ a b Samsó, Julio (1970–80). "Al-Bitruji Al-Ishbili, Abu Ishaq". Dictionary of Scientific Biography. New York: Charles Scribner's Sons. ISBN 978-0-684-10114-9. ^ Nicholas of Cusa, De docta ignorantia, 2.12, p. 103, cited in Koyré (1957), p. 17. ^ van Limpt, Cokky (February 17, 2003). "Favourite quote of founder Joost R. Ritman: God is an infinite sphere". Bibliotheca Philosophica Hermetica. Retrieved November 27, 2018. ^ Joseph 2000, p. 408. ^ Ramasubramanian, K.; Srinivas, M. D.; Sriram, M. S. (1994), "Modification of the earlier Indian planetary theory by the Kerala astronomers (c. 1500 AD) and the implied heliocentric picture of planetary motion", Current Science, 66: 784–790. ^ Roberts, V.; Kennedy, E. S. (1959). "The Planetary Theory of Ibn al-Shatir". Isis. 50 (3): 232–234. doi:10.1086/348774. ^ A. I. Sabra (1998). ^ Saliba, George (July 1, 1995). A History of Arabic Astronomy: Planetary Theories During the Golden Age of Islam. NYU Press. ISBN 9780814780237. ^ Swerdlow, Noel M. (December 31, 1973). "The Derivation and First Draft of Copernicus's Planetary Theory: A Translation of the Commentariolus with Commentary". Proceedings of the American Philosophical Society. 117 (6): 424. ISSN 0003-049X. JSTOR 986461. ^ Cook, Theodore Andrea (1914). The Curves of Life. London: Constable and Company Ltd. p. 390. ^ Arthur Koestler, The Sleepwalkers, Penguin Books, 1959, p. 212. ^ Viktor Blåsjö, "A Critique of the Arguments for Maragha Influence on Copernicus", Journal for the History of Astronomy, 45 (2014), 183-195 ADS. ^ George Saliba (April 27, 2006). "Islamic Science and the Making of Renaissance Europe". Retrieved March 1, 2008. ^ Freely, John (March 30, 2015). Light from the East: How the Science of Medieval Islam Helped to Shape the Western World. I.B.Tauris. p. 179. ISBN 9781784531386. ^ Veselovsky, I. N. (1973), "Copernicus and Nasir al-Din al-Tusi", Journal for the History of Astronomy, 4 (2): 128–30, Bibcode:1973JHA.....4..128V, doi:10.1177/002182867300400205. ^ Kren, Claudia (1971), "The Rolling Device of Naṣir al-Dīn al-Ṭūsī in the De spera of Nicole Oresme", Isis, 62 (4): 490–498, doi:10.1086/350791. ^ Henry, John (2001). Moving heaven and earth : Copernicus and the solar system. Cambridge: Icon. p. 87. ISBN 978-1-84046-251-7. ^ Gingerich, O. "Did Copernicus Owe a Debt to Aristarchus?" Journal for the History of Astronomy, Vol.16, NO.1/FEB, P. 37, 1985. Philolaus had the Earth moving around a Central Fire which was not the Sun, so Copernicus's reference to Aristarchus's model as possibly geodynamic does not necessarily imply that he thought it was heliocentric. ^ A library catalogue of a 16th-century historian, Matthew of Miechow, bears that date and contains a reference to the manuscript, so it must have begun circulating before that date (Koyré, 1973, p.85; Gingerich, 2004, p.32). ^ "Religious Objections to Copernicus". ^ Revolution in Science, I. Bernard Cohen, page 497. ^ Rosen (1995, p.159). Rosen disputes the earlier conclusion of another scholar that this was referring specifically to Copernicus's theory. According to Rosen, Calvin had very likely never heard of Copernicus and was referring instead to "the traditional geokinetic cosmology". ^ Rosen, Edward (1960), Calvin’s attitude toward Copernicus in Journal of the History of Ideas, volume 21, no. 3, July, pp.431–441. Reprinted in Rosen (1995, pp.161–171). ^ Hooykaas, R. (1973). Religion and the rise of modern science. Reprint, Edinburgh: Scottish Academic Press, 1977. ^ Bye, Dan J. (2007). McGrath vs Russell on Calvin vs Copernicus: a case of the pot calling the kettle black? in The Freethinker, volume 127, no. 6, June, pp.8–10. Available online here. ^ Blair, Ann, "Tycho Brahe's critique of Copernicus and the Copernican system", Journal of the History of Ideas, 51, 1990, 364. ^ Drake (1978, p.240), Sharratt (1994, pp.110−111), Favaro (1907, 19:297−298) Archived December 8, 2015, at the Wayback Machine (in Italian). ^ Graney (2015, pp. 68-69) Ingoli's essay was published in English translation for the first time in 2015. ^ a b Finochiario, Maurice (2007). Retrying Galileo. University of California Press. ^ a b (text quotations from 1729 translation of Newton Principia, Book 3 (1729 vol.2) at pages 232–233). ^ In a marginal note in his Massé Touvia (part 2, p.52b): "Remark of the author: I fear that the incredulous may draw an objection from a text of Midrash Bereshit Rabba (V,8) in which our Teachers, the Rabbis, of blessed memory, explain that if the Earth is called in Hebrew "eretz" it is because it hastens ("ratseta") before the Creator in order to accomplish His will. I acknowledge that the answer to this objection seems difficult for me to find", as translated by Neher (1977, p.220). ^ "יפח לקץ - חלק א - שלזינגר, ישראל דוד (page 13 of 134)". www.hebrewbooks.org. Retrieved August 14, 2017. ^ Jeremy, Brown (2008–2009). "Rabbi Reuven Landau and the Jewish Reaction to Copernican Thought in Nineteenth Century Europe" (PDF). The Torah U-Madda Journal. 15: 142. ^ "HebrewBooks.org Sefer Detail: מי מנוחות -- נויזץ, אליעזר ליפמן". hebrewbooks.org. Retrieved August 14, 2017. ^ RABBI NATAN, SLIFKIN. "The Sun's Path at Night: The Revolution in Rabbinic Perspectives on the Ptolemaic Revolution". Rationalist Judaism. Retrieved August 8, 2017. ^ 1964-, Brown, Jeremy, (2013). New heavens and a new earth : the Jewish reception of Copernican thought. Oxford: Oxford University Press. p. 262. ISBN 9780199754793. OCLC 808316428. ^ "on the basis of the presently accepted scientific view (in accordance with the theory of Relativity) that where two bodies in space are in motion relative to one another, it is impossible scientifically to ascertain which revolves around which, or which is stationary and the other in motion. Therefore, to say that there is, or can be, 'scientific proof' that the earth revolves around the sun is quite an unscientific and uncritical statement. "[year needed] ""Igrot Kodesh" v. 7, p.134, letter number 1996". Otzar770.com. Retrieved December 4, 2012. ^ 1964-, Brown, Jeremy, (2013). New heavens and a new earth : the Jewish reception of Copernican thought. Oxford: Oxford University Press. p. 362. ISBN 9780199754793. OCLC 808316428. Fantoli, Annibale (2003). Galileo — For Copernicanism and the Church, 3rd English edition, tr. George V. Coyne, SJ. Vatican Observatory Publications, Notre Dame, IN. ISBN 88-209-7427-4. Favaro, Antonio, ed. (1890–1909). Le Opere di Galileo Galilei, Edizione Nazionale [The Works of Galileo Galilei, National Edition] (in Italian). Florence: Barbera. ISBN 978-88-09-20881-0. Archived from the original on July 13, 2007. A searchable online copy is available on the Institute and Museum of the History of Science, Florence, and a brief overview of Le Opere is available at Finn's fine books, and here. Heilbron, John L. (2005). "Censorship of Astronomy in Italy after Galileo". In McMullin, Ernan (ed.). The Church and Galileo. University of Notre Dame Press, Notre Dame. ISBN 978-0-268-03483-2. Heilbron, John L. (2010). "Biography of Galileo". Galileo. Oxford University Press, Oxford. Joseph, George G. (2000). The Crest of the Peacock: Non-European Roots of Mathematics (2nd ed.). London: Penguin Books. ISBN 0-691-00659-8. Russo, Lucio (December 1, 2013). The Forgotten Revolution: How Science Was Born in 300 BC and Why it Had to Be Reborn. Translated by Levy, Silvio. Springer Science & Business Media. ISBN 9783642189043. Retrieved June 13, 2017. Russo, Lucio; Medaglia, Silvio M. (1996). "Sulla presunta accusa di empietà ad Aristarco di Samo". Quaderni Urbinati di Cultura Classica (in Italian). New Series, Vol. 53 (2): 113–121. JSTOR 20547344. Sabra, A. I. (1998), "Configuring the Universe: Aporetic, Problem Solving, and Kinematic Modeling as Themes of Arabic Astronomy", Perspectives on Science, 6: 288–330. Saliba, George (1999). Whose Science is Arabic Science in Renaissance Europe? Columbia University. Thurston, Hugh (1993). Early Astronomy. New York: Springer-Verlag. ISBN 978-0-387-94107-3. "Does Heliocentrism Mean That the Sun is Stationary?". Scienceray. Archived from the original on August 16, 2013. Retrieved November 27, 2018.